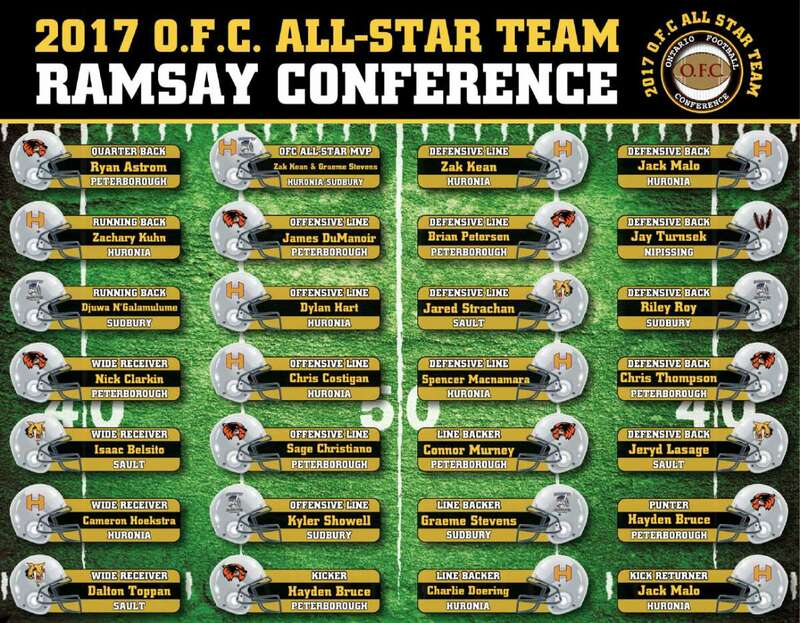 The Ontario Football Conference (OFC) recently released its 2017 positional all-stars and Conference MVP winners. The Huronia Stallions had seven players honoured including one players who earned all-star distinction at two positions. Zachary Kuhn was named an all-star at running back and earned the distinction of being named Conference co-MVP alongside Graeme Stevens of Sudbury. Jack Malo was named an all-star at both defensive back and kick returner. Dylan Hart (offensive line), Chris Costigan (offensive line), Spencer MacNamara (defensive line), Zak Kean (defensive line), and Charlie Doering (linebacker) were the other stallions who earned all-star nods. The Huronia Stallions Junior Varsity team fell to the unbeaten Peterborough Wolverines 49-7 in the OFC’s Northern Conference title game. The loss marks the first time since the Stallions joined the OFC in 2011 that they did not send at least one team (Varsity, Junior Varsity, or Bantam) to an OFC Championship game. The Wolverines controlled the game on the strength of their dominant running game which routinely ripped off big chunks of yardage against an overmatched Stallions front 7. The Stallions were able to move the ball fairly well on the ground but threw two costly first half interceptions and struggled to get first downs in second and short situations. The Stallions kept the game close in the first half entering the locker room down 21-7. Running back Matthew Koufis ran very well throughout the game and scored the team’s lone touchdown. In the second half, the Wolverines scored a touchdown after an impressive opening series. The Stallions who overcame adversity the week before by coming up with a huge comeback after a large first half deficit did not quit and fought back. On their first possession of the second half, The Stallions drove all the way down to the Peterborough seven yard line but couldn’t punch it in after three valiant tries. Peterborough then intercepted the Stallions on the next series and returned it for a touchdown and followed that with a punt return touchdown which ended any hopes for a second consecutive come from behind victory. Coach Martino DiSabatino credited the Wolverines stating: “(Peterborough) was bigger and stronger than us and they pushed us around. When that happens you try to pull everything you can out of your pockets, hats, underwear, but it didn't work. That's what they tried to do. I give them credit. They did exactly what got them here. They just played smash mouth football.” Coach DiSabatino also expressed pride in the achievements of this season’s JV team and emphasized that they are a young squad who will benefit from the experience of playing three playoff games.